This Rotary Foundation project aims to sink 4km of pipe network into the deeper area of the Emboocha river to send water to a storage tank close by. This in turn will be connected to another newly constructed storage tank in the village (at the primary school), via a new water supply system. From here a stand pipe is to be installed to allow villagers to come and collect water for their use. The river is situated over the adjacent ravine and is at a higher level than the village so the forces of gravity will be used to deliver the water. The river flow varies due to the season but is always evident. The water will be 'tapped' sufficiently far enough 'upstream' that it is not contaminated by animals or humans. The land and water access have been granted for the laying of the pipes. A large team of men from the village are ready to assist by providing the necessary labour for the installation of the system. The water supply will be accessible and used by all Villagers thus benefiting the entire village community. The supply of cleaner water to the village will lead to better education (children will be able to spend more time on tasks at school), health (reduced occurrence of disease), improved cohesion and community spirit for a successful project. The villagers will raise sufficient funds to maintain the water system. This amount will be small enough so as not to exclude any household from access to the supply. 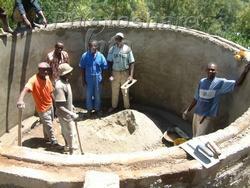 The elected village water committee will oversee the maintenance and management of the system.